ASDIP is utilized by structural engineers to cost effectively design, analyze, check, and optimize engineering projects in less time. Quickly model your structure with the simple and efficient graphical user interface. Detailed step-by-step reports with exposed formulas and Code references. Impress clients and plan-checkers with eye-catching condensed or detailed reports. No silly assumptions or math shortcuts. Reliable, accurate results. Confidently optimize your design and comply with design Code provisions. Extensive documentation, solved examples, and blog posts to guide you throughout the software. Use your valuable time wisely while ASDIP does the hard work for you. Safely create, organize, manage, and store your electronic calculations. Includes 3 modules for design of continuous beams, biaxial columns, and out-of-plane bearing walls. Includes 3 modules for design of spread footings, strap footings, and combined footings. Includes 3 modules for design of cantilever retaining walls, top-restrained retaining walls, and counterfort retaining walls. Includes 4 modules for design of base plates, anchor rods, columns, steel & composite beams, shear connections. I purchased the entire ASDIP software suite. After using ASDIP for a few months I believe it works well for its intended purpose. ASDIP is very simple, reasonably priced, and calculation output is organized with a nice layout. The suite of design programs ASDIP is an excellent complement to the analysis of concrete and steel structures. We use them in most of our important structural projects such as tall buildings, industrial plants, and special projects. The results are presented in a useful format to keep track of the calculations, and the software easily lets you change the input and optimize the results. I have been using ASDIP structural engineering software in my profession and I find it very helpful. This engineering software saves me a lot of time, it's easy to use, and the results are very accurate. I hope ASDIP Structural Software can develop more software packages to assist me in my design work. We offer the following two types of licenses. In both cases the license is conveniently authenticated online during the installation. No further need to even be connected to the internet. Local License: A local individual license is simple to install and can be utilized on two of your own computers. Typically, an individual licensee will install the software on their own desktop and on their own laptop. Floating Network License: A floating network license is installed in a server. Other computers connected in the network use that license one user at a time. Need to move the license to another computer? No problem, just uninstall it and install it back in the new computer. Our server will take care of the authentication process. Do not copy, install, or use this software until you have carefully read this agreement, which provides the following terms and conditions for its use. Copying, installing, or otherwise using the software indicates that you have read, understand and accept the terms of this Agreement. If you do not accept this Agreement, then return the software and accompanying items to us within 30 days of purchase for a refund. accompanying documentation, and all intellectual property rights therein. Subject to the License Restrictions below, you are granted a personal, non-exclusive license to use one copy of the Software and any updates thereof on a single computer at a time. You may authenticate your license in a second computer, but not in a third, since only two authentications are granted and the license is tied to your computer name. You may make one archival or backup copy of the software for your own use. However, because the Software is protected by the copyright laws, it is illegal: to make additional copies or otherwise duplicate the Software by any other means (including electronic transmission); to give copies to another person; or, to modify, adapt, translate, rent, sublicense, loan, resell for profit, distribute, create derivative works based upon or network the Software or any part thereof. copyright notices from the Software screens and printouts. ASDIP Structural Software does not grant any express or implied right to you under patents, copy rights, trademarks, or trade secret information. The Software is provided "AS IS" without warranty of any kind. If the media on which the Software is furnished are found to be defective in material or workmanship under normal use within a period of thirty (30) days from the date of receipt, ASDIP Structural Software's entire liability and your exclusive remedy shall be the replacement of the media. This offer is void if the media defect results from accident, abuse, or misapplication. To the maximum extent permitted by law, ASDIP Structural Software disclaims all other warranties, either express or implied, including, but not limited to, implied warranties or merchantability and fitness for a particular purpose, with regard to the Software and the accompanying materials. This limited warranty gives you specific legal rights. You may have other rights depending upon the laws of your state or jurisdiction. To the maximum extent permitted by applicable law, in no event shall ASDIP Structural Software be liable for any damages whatsoever (including, without limitation, damages for loss of business profits, business interruption, loss of business information, or any other loss) arising out of the use of or inability to use this Software. ASDIP Structural Software makes no warranties, either expressed or implied, as to the quality and performance of the Software, that the calculations contained in the Software will meet your requirements, or that the operation of the Software will be uninterrupted or error free. You agree that the Software is intended to aid you in performing engineering-oriented mathematical calculations, and that the results obtained from the Software do not necessarily constitute an acceptable engineering design or analysis. You agree that results of the Software shall be reviewed by persons possessing experience and thorough understanding of the engineering principles that apply or might apply to the usage of and results of the Software. In no event shall ASDIP Structural Software's total liability to you for all damages, losses, claims, and causes of action (whether in contract or otherwise) exceed the amount paid by you for the Software. What's the one feature you appreciate the most in a structural design software? Avoid over-complication and too much input for routine design scenarios? 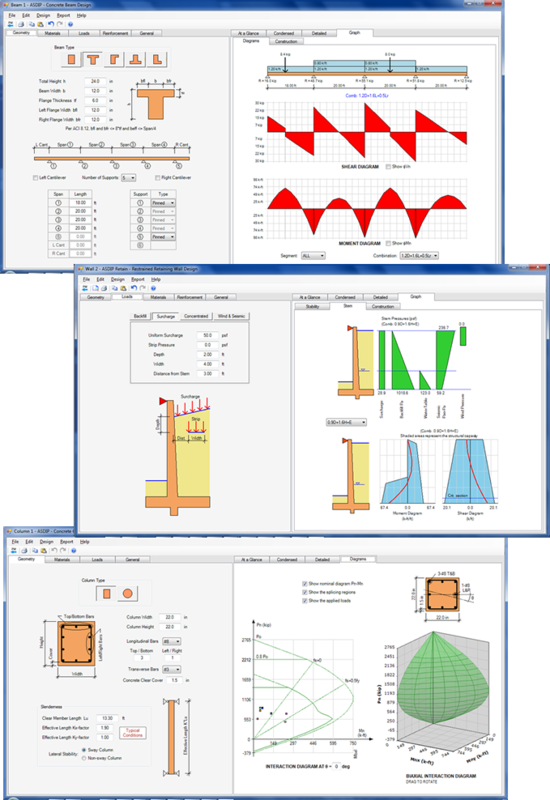 Enjoy a simple, focused, and intuitive structural design software? Model quickly your actual conditions in a user-friendly environment? Produce detailed step-by-step calculations and reports? Optimize your design and comply 100% with the Code provisions? Get reports with exposed formulas and references to the Code? Have access to a detailed Help file with information of the software? Be able to follow solved step-by-step verification examples? Receive relevant blog posts periodically with technical discussions?